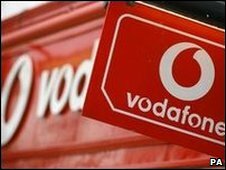 Mobile phone giant Vodafone has announced it is cutting 375 jobs across its business from March. Vodafone said the roles affected would be primarily in back office positions including at its UK headquarters in Newbury, Berkshire. The company said it would also take on 170 new staff in customer-facing roles. The Prospect union condemned Vodafone for a "lack of consultation" and said it was "disappointed" to learn the news from the media, not the company. Union spokesman Steve Thomas said: "This is a disgraceful way to treat employees, particularly some very long serving and loyal members of staff who have been with Vodafone from the early days and have made the company a success." Matthew Brearley, HR Director, Vodafone UK said: "We're committed to increasing the number of customer facing employees which will help us simplify our business and continue to deliver outstanding communications services across the UK's best network." Vodafone will also select 50 graduates to start in September from more than 3,000 who have applied to its UK graduate programme.